Have you ever tried watching your children play? I do this often. I get on the floor with them, observe them, and get a really good insight into how they think, what makes them tick, and how their learn. Come to think of it, it’s amazing really – it is an easy, enjoyable way to help me get to know my children better. And I might have 3 boys, but they are definitely very different from each other! So when I see them engrossed in an activity, I stop and focus on their actions, expressions, gestures and behaviours, and I start paying attention to their talk and interactions. 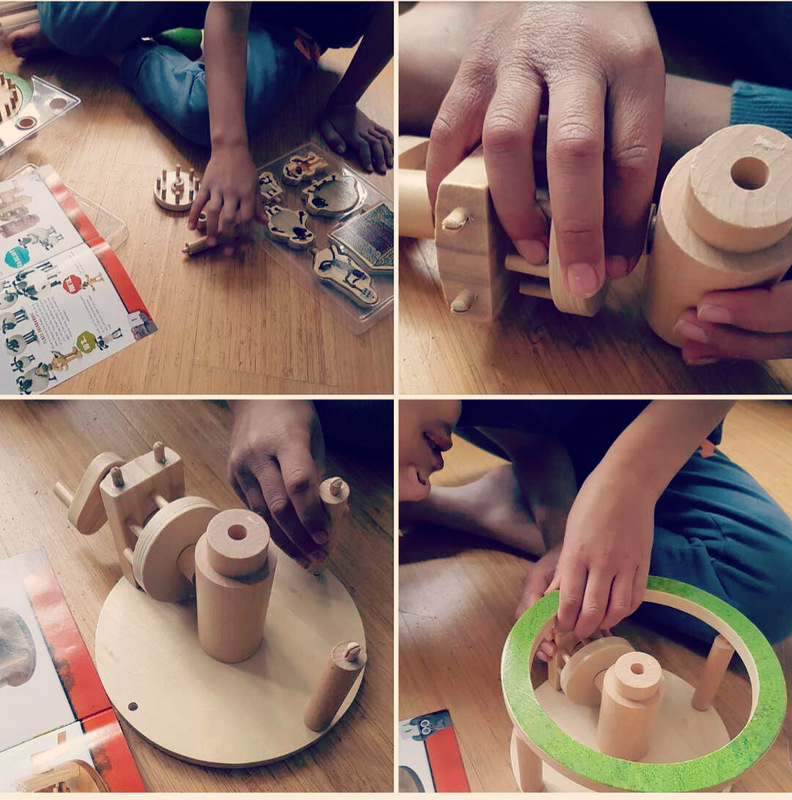 Last week, my two eldest boys and I had the opportunity to assemble two Timberkits natural wood mechanical moving models (in kit form). 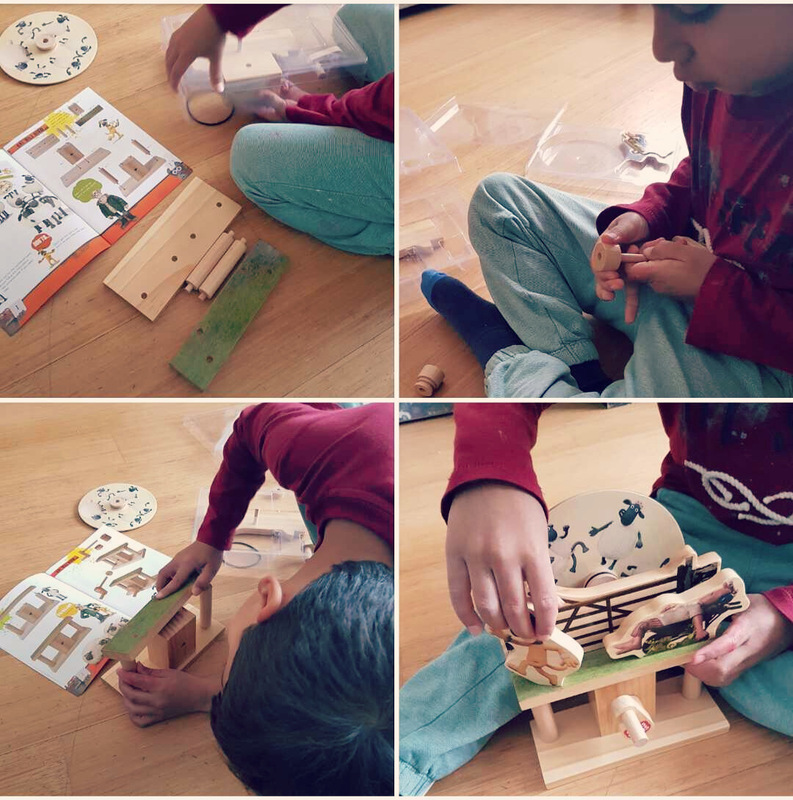 I helped my 5-year-old (a.k.a., on this blog, The Middle Guy) build the Timberkits Shaun the Sheep Sleepy Farmer Kit, and my 8-year-old (a.k.a. 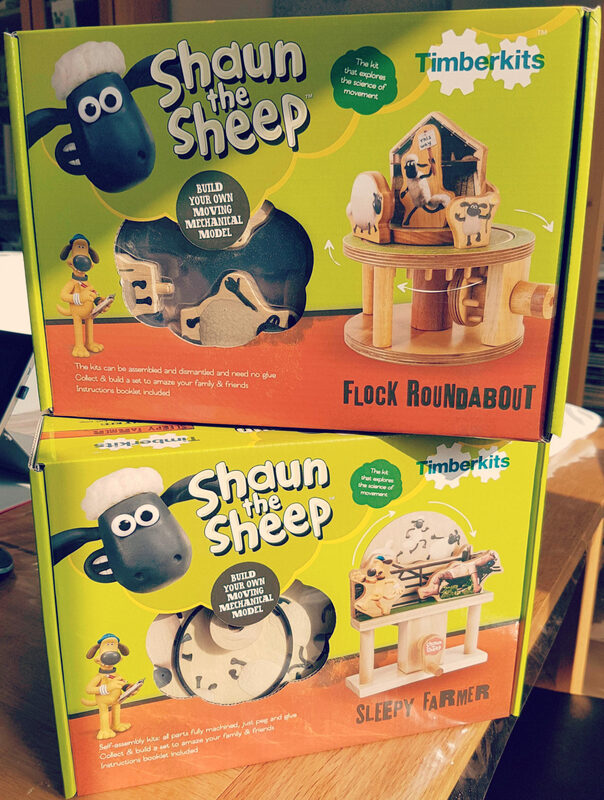 The Big Guy) build the Timberkits Shaun the Sheep Flock Roundabout Kit. After helping The Middle Guy to open the box, I watched him hand the instructions over to me. He hadn’t even looked at them yet, but the fact he wanted me to have them already tells me a couple of things about him right now. Clearly he made an assumption about the fact that he wouldn’t be able to read or follow them on his own. And that’s probably a confidence issue – he’s in Reception and still learning to read, so he knows he can read the books he’s given at school but can’t yet master everything he comes across outside the safe environment of his classroom. Interesting. The instructions on the Timberkits Shaun the Sheep kits are perfect for his age group though – yes, there is an element of reading involved, but he could have easily looked at the images, enjoyed the funny characters and tried to follow them independently. With a little bit of encouragement from me, he proceeded to lining all the pieces together as he’d seen on the instructions, ready to assemble them. He then told me that he knows the characters, as he’s watched ‘the movie’. He was keen on me reading the instructions to him, so I did that for him. And with a bit of encouragement, he started assembling his kit. He needed some help to peg and slot some of the pieces together, but overall, he did it all by himself. Not without a little break and a play though! Of course as I was taking my time turning the pages and reading the next step (with his attention spam being quite short) he started playing with the ‘wheel part’ of the kit! How? He challenged himself to use it as a spinning top! As an adult, you’d never think of doing that – we tend to lose the tendency to play and discover as we get older, don’t we? It’s fascinating to get a little peek into how the mind of a child works! As soon as we finished putting it together, we exchanged a quick look and a smile. I could tell how proud he was. He turned the handle a few times to watch the movement and asked me if we could start again. So we did, and of course knowing now (roughly) what he had to do, he required a lot less input from me. His belief in himself and his confidence in his own skills at assembling a construction kit had blossomed. And all in the space of 10-15 minutes! The Shaun the Sheep Flock Roundabout Kit has a few more pieces than the Shaun the Sheep Sleep Farmer Kit. The moving mechanism seems a little more complicated, so it felt more suitable for my 8-year-old. Despite having the instructions in front of us (and no excuse for him here – he definitely can read very well), I saw that he didn’t pay much attention to them. And as a result, he did struggle to put the moving mechanism together! I did notice his method was quite similar to his brother’s though – he also took all the pieces out first and lined them up before proceeding to assembling the kit. Being methodical is certainly a trait in our family! Something I loved in both boys is how they both naturally bent their heads to be able to see how all the pieces slotted together. They had to observe that from underneath, or they wouldn’t be able to slot them in properly! They were both faced with the same challenge and both solved it in the same way, without any prompts from me. What I loved the most about watching The Big Guy assemble his kit is how he really tried to figure out how each piece worked in conjunction with the others. I could see he really wanted to understand how turning the handle was creating movement in the top part of the kit. So he observed it for a while, and then he said: “Look Mamma, it’s a puzzle!” And once again, I was stood in front of a little boy who was beaming with pride! In fact, he even ran to his Dad, to show him what he’d made. Since making the kits for the first time, we have taken them both apart a few times. In fact, their younger brother (a.k.a. The Little Guy, who’s 2) has certainly helped them to do that! He loves taking the fun, tactile and colourful characters off the kits and walk around the house with them. I’ve found one safely tucked into his nursery bag and a few being carried around the house in a sand bucket! Of course this means I have to go on a hunt to find all the missing pieces every time we want to put the kits together again, but I do this on purpose. I purposely leave the kits somewhere accessible to the boys, as I definitely want to see how they interact with them. I’ve watched them experimenting and exploring the science of movement. But also moving the characters around, swapping them, and even trying to see if the various components were interchangeable between the kits. And often this has produced quite random results! What about you? Do you ever watch your children play? What kind of things have you observed or learned about them? 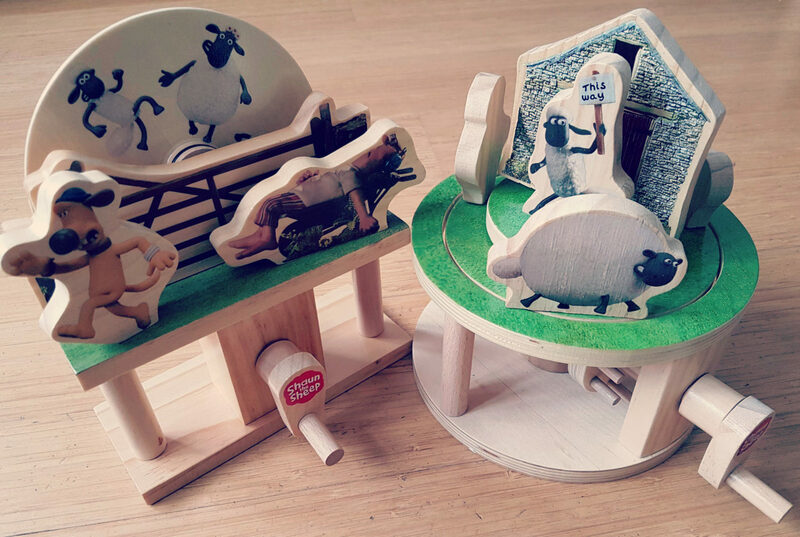 *This was a collaborative post with Timberkits who kindly provided us with the Shaun The Sheep Farmer Kit and the Shaun the Sheep Flock Roundabout Kit. All ideas and observations expressed in this post are my own. Next Post Would you recognise the signs and symptoms of stress if they were staring at you in the face?